When I moved from North Carolina a year ago, I took several Carolina style sauces with me. I fell in love with Carolina "Q" and hoped to preserve its tangy tradition for a long as possible. Sadly, my supply of sauces quickly ran out. During the last several months, I've been craving the familiar flavors of North Carolina BBQ. I've smoked several shoulders and concocted my own vinegar based sauces with varied degrees of success. It wasn't until a package of Delwood's Barbecue Sauce reached my doorstep that I found what I was really looking for. Delwood's Barbecue Sauce & Marinade is an authentic North Carolina BBQ sauce. 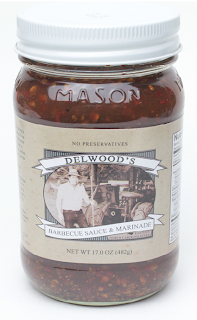 Produced by a second generation Delwood, the sauce is crafted in the traditions of Eastern style BBQ. Bottled in 17 oz mason jars, and slapped with a vintage label, Delwood's has the perfect Ol' Time look for a fabulous Ol' Time product. The dark vinegar sauce is loaded with coarsely ground spices that can be seen floating freely through the jar. Vinegar is King when it comes to Carolina BBQ, and Delwood's does not deviate from tradition. Delwood's sauce uses apple cider vinegar which provides plenty of tang, but also a little sweetness. The traditional base is kicked up with a variety of spices. The addition of brown sugar adds to the sweetness and provides a nice balance to the tang and spice. I've used Delwood's Barbecue Sauce & Marinade several times, savoring every bite. The natural fit was to pour it over pulled pork. Paired with the smoky shoulder meat, Delwood's brought back a flood of pleasant memories from my Carolina days. Some people may find the vinegar tang of Delwood's to be a little overwhelming, but for those that favor the traditional flavors of Carolina "Q", you'll have a hard time finding something better than Delwood's. When I want to introduce my Michigan friends to traditional Carolina style sauce, Delwood's will be the jar I reach for. I realize this may come off sounding more like an advertisement for Delwood's than a critical review. Believe me when I say that I tried to find something to criticize. I love the packaging and I love the flavor. If you live in Central North Carolina, I strongly recommend locating a retailer that sells Delwood's. If not, check them out online. 1 Response to "Delwood's Barbecue Sauce & Marinade"
The free site for the windows resolution is windowsresolution.com for the free resolutions for the windows to get online for free.